Virgin Trains East Coast staff are to be balloted for industrial action in a row over pay and conditions. The Rail, Maritime and Transport (RMT) union said poor conditions were being imposed on workers as well as changes to working conditions and sick pay. If members vote in favour of strike action, walkouts could take place early in the new year. 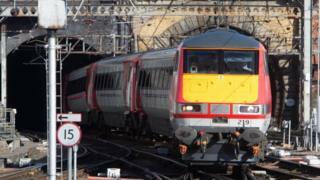 Virgin Trains East Coast said it was disappointed its offer of a "very fair 3.2% pay increase" was not accepted. The ballot, which closes on 20 December, comes days after it was announced that the East Coast franchise, which runs between London, north-east England and Scotland, will end three years early in 2020. The decision has sparked financial concerns across the industry as the franchise, a partnership between Stagecoach and Virgin, had agreed to pay the government £3.3bn to run the service until 2023. RMT general secretary Mick Cash said the company had "sought to impose" a pay offer and that it was rejected by a large majority of its members. The union said terms and conditions of hand-selected grades were being "attacked", while others were being "better rewarded and left alone". It said some 2,000 members were being balloted and it covered all train crew staff including train managers, drivers and on-board catering workers. Mr Cash said: "Our members must not be forced to pay the price for the gross financial mismanagement of this franchise which now sees Virgin/Stagecoach being lined up for a taxpayer-funded rescue operation by the government to the tune of hundreds of millions of pounds." A Virgin Trains spokesman said: "We can reassure customers that we expect to be able to run a near-normal service in the event of any industrial action." Both Virgin and the RMT said they remained available for talks. The Department for Transport said financial commitments made with the East Coast operator would continue. Reality Check: Are we having more rail strikes than usual?